Choose “Sliders” at the bottom of the plugin panel to active slider controls for six different color models. Use sliders when you want to leave 3D and control each dimension manually. The slider works identically in both Color Picker and Palette View. 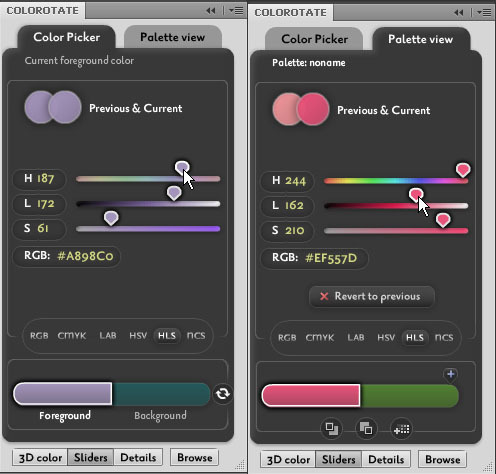 In Slider Mode, as shown below in the screenshot, you can manually choose and edit your colors by simply sliding the colors instead of using the 3D tool. You can also choose and edit your colors in six color models – RGB, CMYK, LAB, HSV, HLS and NCS. In Palette View, there is a button right below the color slider with a red X symbol. It is used for reverting to the previous color you chose. It’s analogous to Crtl+D in Photoshop. The Color Picker and Palette View in Slider Mode. RGB: Red, Blue, and Green. It is the most widely used color model, and uses tri-color to produce different colors. RGB is used in most digital cameras, televisions, CRT and LCD monitors. CMYK: Cyan, Magenta, Yellow, and Black. Unlike RGB, CMYK uses four colors and is primarily used for color printing. The color produced by CMYK is more accurate than RGB. It is impossible to see CMYK color in televisions and CRT and LCD monitors. A special type of monitor is needed to visualize it. LAB: LAB is different from both RGB and CMYK. It is designed to approximate human vision and is primarily used for scientific research. HSV: Hue, Saturation, and Value. It is an improved version of RGB and depicts relationships between colors. HLS: Hue, Lightness, and Saturation. It is a 3D representation of color. The 3D diamond-shaped Color Picker is based on the HLS Color Model. NCS: The Natural Color System is based on six colors that cannot be used to describe one another: white, black, red, yellow, green, and blue. NCS colors have three values: darkness, saturation, and hue.